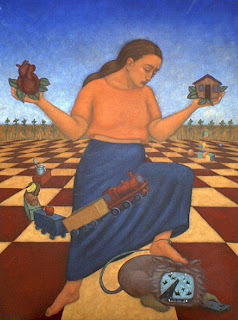 For me, this painting is a warning about keeping the home and heart safe while controlling influences that come into our lives through all kinds of technology in the global community. This is such a wonderful painting! Not only does it speak of warning, but also about balance! Very beautiful. I love this painting. I love the checkerboard landscape and flying train. Lovely illustration. Beautiful, I love to click on your art and look at all the hidden meanings that may be there. You create such thought provoking imagery, in addition to being beautiful, too! This reminds me of Salvador Dali. Maybe it's just the checkerboard and flying train? I like your colors.